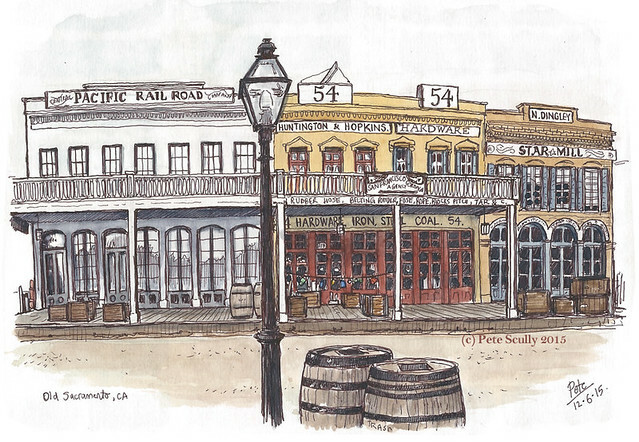 This is Old Town Sacramento, sketched almost a month ago now, though it looks very much the same. 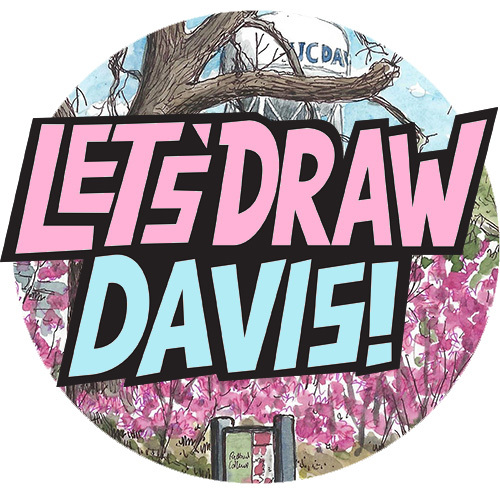 I drew it while my wife and her sister and the kids were in the California Railroad Museum, which is next door to this row. Sketching Old Sac means sketching lots of windows, lots of those little bollard things on balconies (what are they called? I must look it up), oh and wooden boxes, just lying around for no apparent reason than to give Old Sac its Authentic Look. This was the last sketch in a sketchbook. This is actually called the Big Four House, and is a National Historic Monument dating back to the 1850s, very much the California Gold Rush era. Now the Big Four were actually four tycoons most usually associated with building the Central Pacific Railroad: Leland Stanford (he of the University), Collis Potter Huntington, Mark Hopkins and Charles Crocker (he of the Art Museum). Fantastic drawing. It’s remarkable how much detail you get into each sketch. Are those things called balustrades? Maybe not. The word just sprang to mind. I think you might be right. I just looked it up in a book ‘How To Read Buildings’ and I think they’re also called ‘balusters’ so it sounds right. I’ve heard of balustrades at least. I’ve stood right there and can actually see the memory when I look at this drawing! I stood there ten years ago when I first moved to California, and this still reminds me of that first week here. It hasn’t changed at all. Thanks for the history lesson as a bonus to the fab sketch, I am sure the Old Sac Chamber would love to see this! Cheers! I like a bit of history.